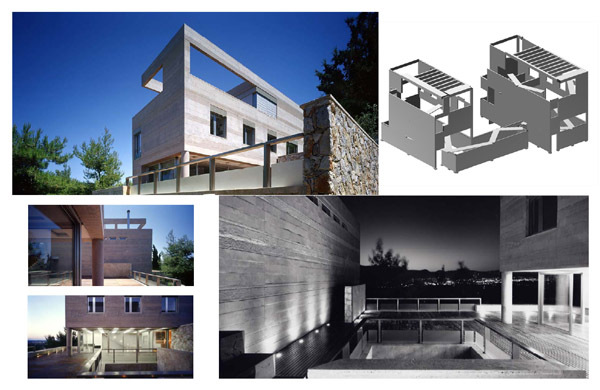 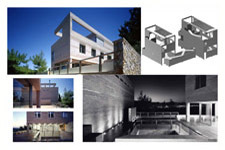 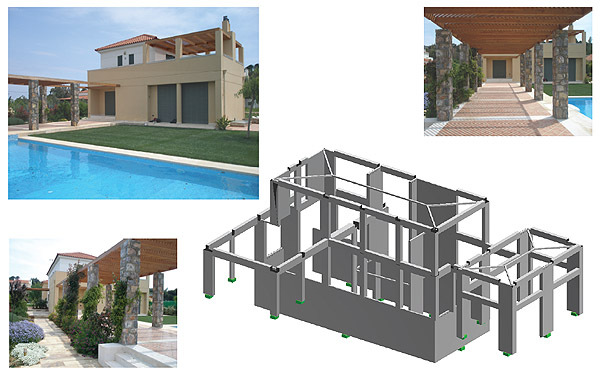 In modern architecture, building forms where the structural system itself is also the most important element of the architectural solution, are to be accomplished. 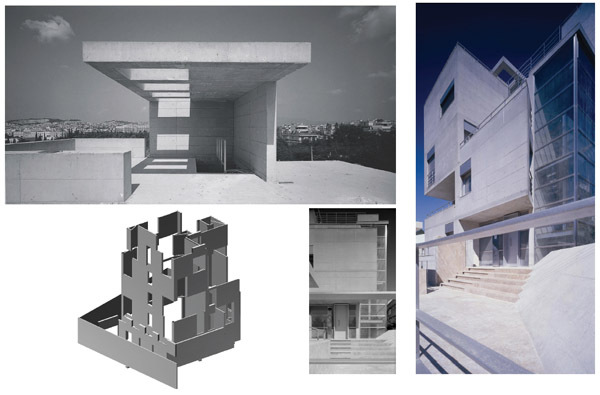 Such buildings have a dynamic spatial arrangement, often consist of complex surfaces and folded structural elements of concrete, have slabs of arbitrary form without beams that sometimes are supported on thin columns. Despite of their asymmetries, their static and seismic behavior should be perfect, in order to avoid damages even under a design earthquake. 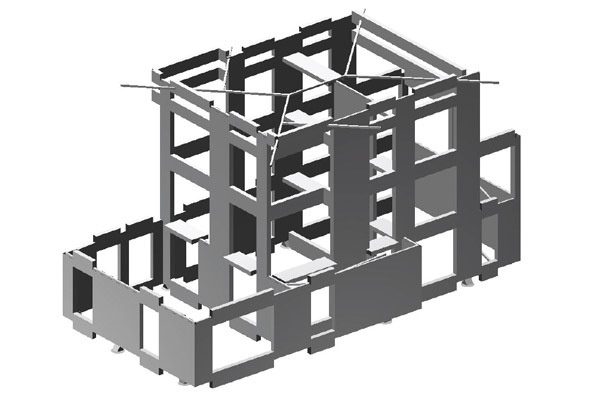 These targets are achieved only by detailed design of these particular vulnerable elements and aqurate analysis of the complex structural systems as a hole. 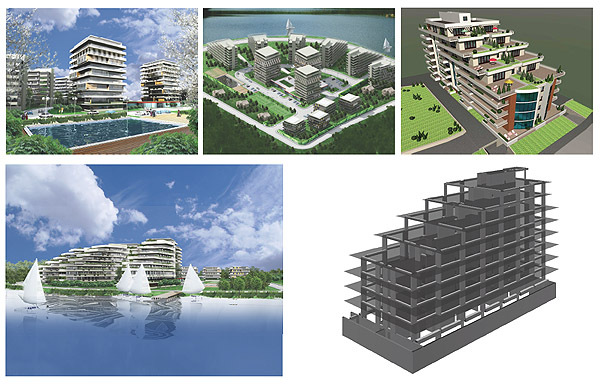 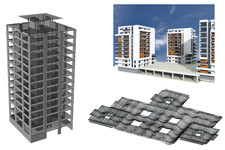 The construction solution will often include composite structures (steel + concrete), special connections and sometimes prestressing. 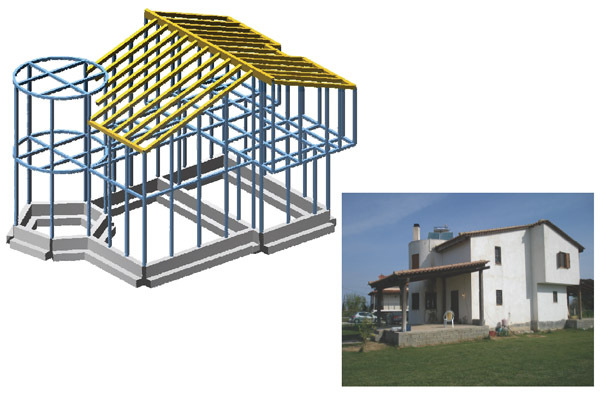 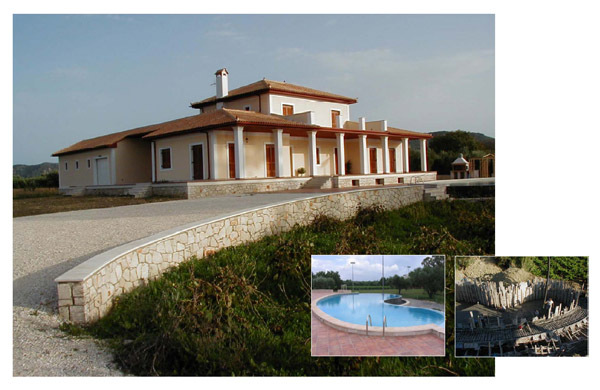 A traditional residence in an area of high seismic risk was calculated, so that it may suffer a horizontal seismic force three times greater than the required by the Code (elastic behavior), with no significant economical impact. 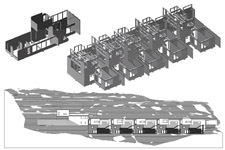 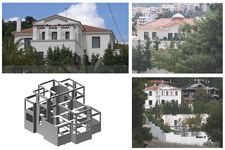 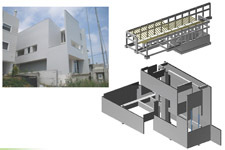 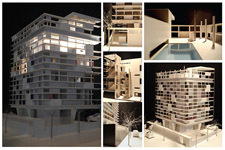 Urban residences in the areas of Ekali and Papagou were calculated as entirely folded structures or shells, supported on linear or point supports on walls or columns of high strength. 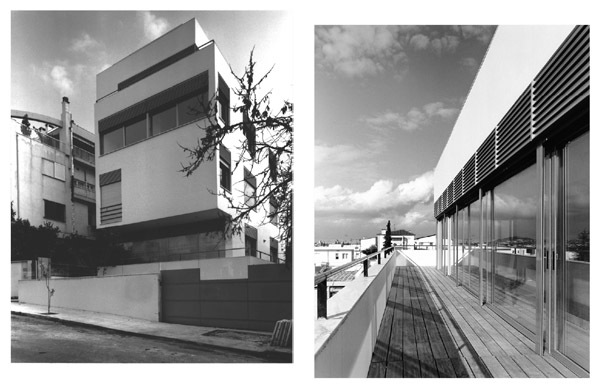 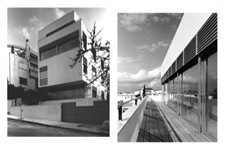 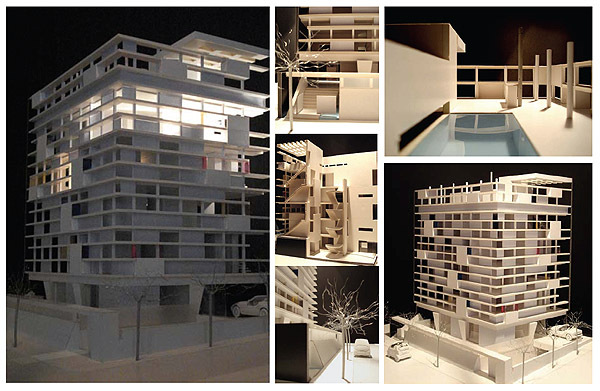 A four story apartment building in Papagou was formed by orthogonal shapes with transitions, so that they form balconies and terraces. The bearing structure is the architectural shell, which is always visible and has been calculated so that no damage will occur during a design earthquake. 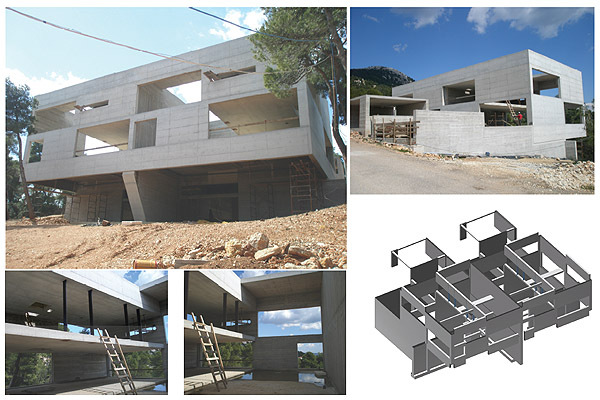 In another luxury residence in Pikermi the bearing structure embodies all elements, including internal walls. 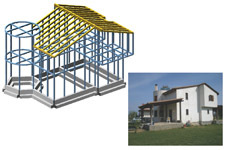 Plates are of random shape, without any beam, partially prestressed. 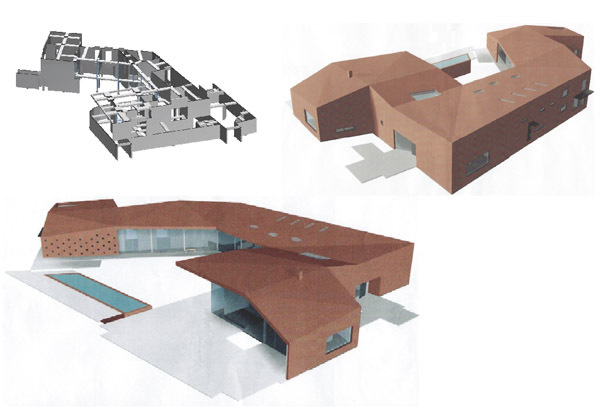 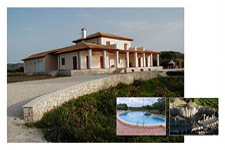 The roof is covered by a high performance fiber reinforced concrete floor of folded shape. 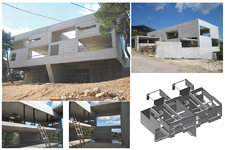 Walls are made of concrete, in random directions, with many openings and connect the plates vertically assuring that the structure is practically non-deformable during occasional earthquakes. 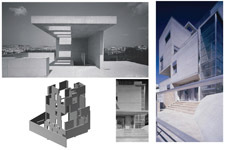 Stairs are made also of high performance concrete. 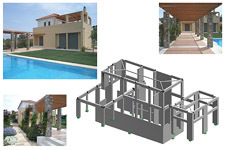 Columns are composite elements of steel and concrete. High requirements of deformation reduction in the glass-facade enforce precise calculations even under temperature differences and long-term creep phenomena.